If your child is unwell and will not be attending nursery, please call the School Office as soon as possible. It is our policy that children with sickness or diarrhoea do not attend for 48 hours after the last episode, this is important to limit the spread of bugs. Children joining us for the afternoon (from 12pm) or staying all day are invited to bring a packed lunch to eat at Nursery. Children attending morning sessions will leave before lunch and will not therefore need to bring provisions. When you drop off your child in the morning you will need to enter the school via the main gate and make your way to the nursery class entrance where a member of staff will meet you. Please be aware that the main school starts at 8.40 so the site can feel very busy at this time. A member of nursery staff will stand at the nursery gate with a member of school staff on the front gates. 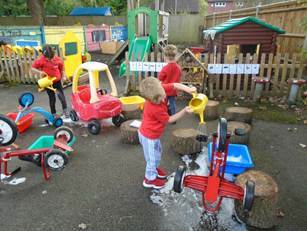 Please see your child into the nursery classroom, children should not be left on the playground or in the outdoor area at this time – they will have plenty of quality time outside throughout the day. If you are late arriving the school gates will be shut and you will need to enter through the big blue door and via the main school office. Please remember that the school site needs to remain secure so we would ask that you arrive promptly at the beginning and end of each session. Again please come to the nursery outside area to collect your child. The nursery staff will let your child leave when they see that you are there to collect them. This is a good time to talk to your child’s key person about their day, but please wait until all the children have been dismissed safely. Therefore the nursery staff will bring your children to the double gates for you to collect. A member of nursery staff will also be on hand to meet those children joining us for the afternoon session. We aim to provide a safe and exciting learning environment for all our children. However as we encourage them to become increasingly independent and teach them to manage risks, accidents can happen. The school uses the St John Ambulance first aid calculator to determine the number of first aiders required. Our nursery team have paediatric first aid training. The nursery staff keep a record of all accidents, including details of existing injuries, the date, time and nature of the accident, a written description of the injury and details of any first aid given. You will be informed of any accidents and asked to sign this record. In addition we also record incidents that take place in our setting, this could include disputes between children or extreme reactions to a common situation, for example a hysterical response to a thunder storm or fire alarm. We will discuss any such incidents with you. Inform us of any existing injuries and any care given at home – for example – Billy bumped his head last night, he has a small bruise above his left eyebrow. Talk to us about any fears or phobias your child may have – for example – Emily doesn’t like men with beards (surprisingly common). Tell us if your child has an unusual reaction to a common incident – for example – Jack was very upset when some big children were noisy at the park yesterday afternoon. You know your child better than anyone. If you feel something isn’t right, even if you can’t put your finger on it, we need to know. All of this information can help us attend to your child’s needs and personalise their provision. Your child’s comfort and privacy are very important to us. Our intimate care policy is used throughout the school but is used much more frequently in our foundation unit and particularly in nursery. Almost all children of nursery age require help with toileting and personal hygiene. Intimate care is defined as any care that involves washing or touching a child. For example help with eating, drinking and toileting. Children have the right to feel safe and secure. Children have the right to an education and schools have a duty to identify and remove barriers to learning and participation for pupils of all abilities and needs. Children should be respected and valued as individuals. Children have the right to privacy, dignity and a professional approach from staff when meeting their needs. Children have the right to express their views and have them heard. Procedures for intimate care can be found in all areas of the school where this might take place, for example toilets and nappy changing stations. Our nursery staff will keep a record each time a child receives intimate care. You can ask to see this at any time. Staff will of course notify you if they have any concerns and will always consult with you before using any creams in the cases of rashes or sores. Talk to us and keep talking. At this young age children’s needs and preferences can change on a daily basis. Please be mindful of our little learners, shut doors and gates behind you and never hold the front door open for others.